The following analysis was prepared using tools offered by Sentieo. 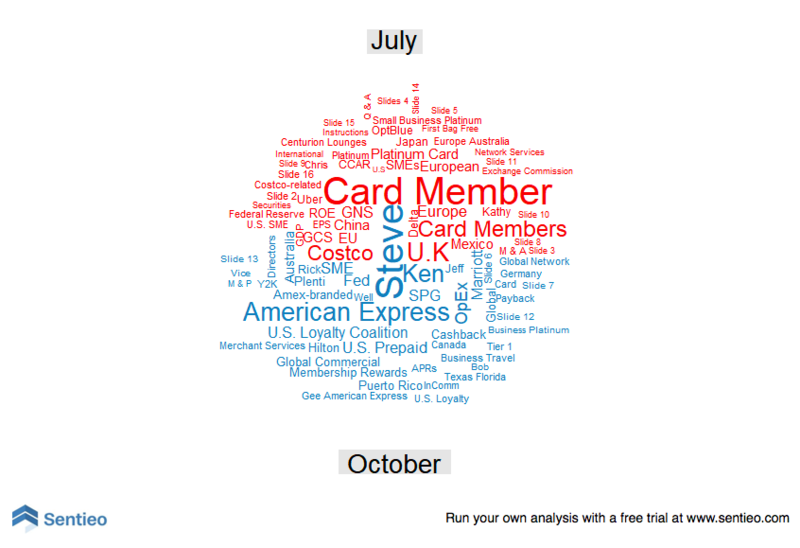 Sign up for a free trial to run the analysis yourself. 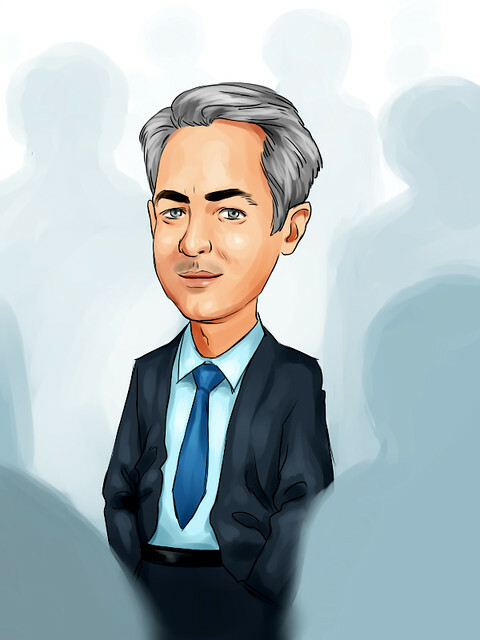 While the new CEO was viewed positively by the Street, and was perhaps previewed in a previous call, the conference call event itself showed an increasing divergence in the direction of the discussion between analysts and management, where analysts are focused more on profitability metrics and card program concerns, while management talked much more broadly. Given this, and the negative divergence in our sentiment metrics between Management and analysts, it would be prudent to be more cautious on AXP stock at these levels. American Express announced a CEO change this quarter. Versus last quarter, management commentary obviously focused mostly on the new CEO and broad commentary around the company. However, the Sentiment Spread, a measure of the bullishness of management vs analysts, has turned down sharply, suggesting over-confidence by analysts. 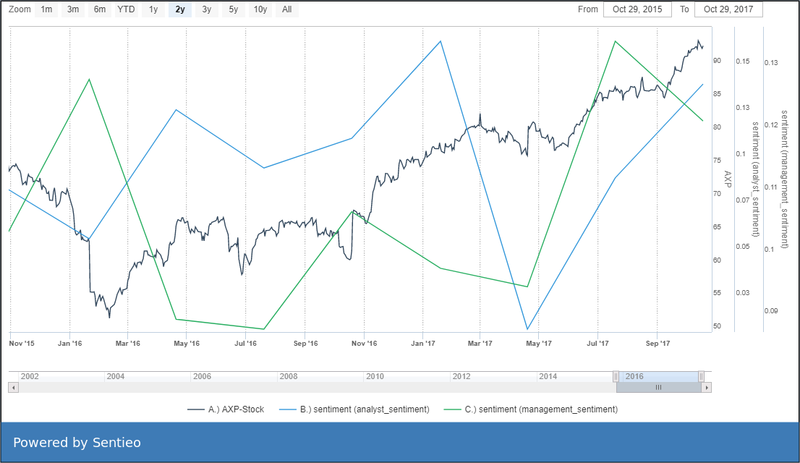 As shown, analyst sentiment has rebounded sharply, while management sentiment has ticked down, and the stock is at a high. American Express began talking more about the outgoing CEO Ken Chenault last quarter. This quarter they are talking less about products and ROE targets, and more about their domestic business broadly. Analysts, while talking a lot about the outgoing and new CEOs, were much more interested in profitability metrics and the new guidance slide. 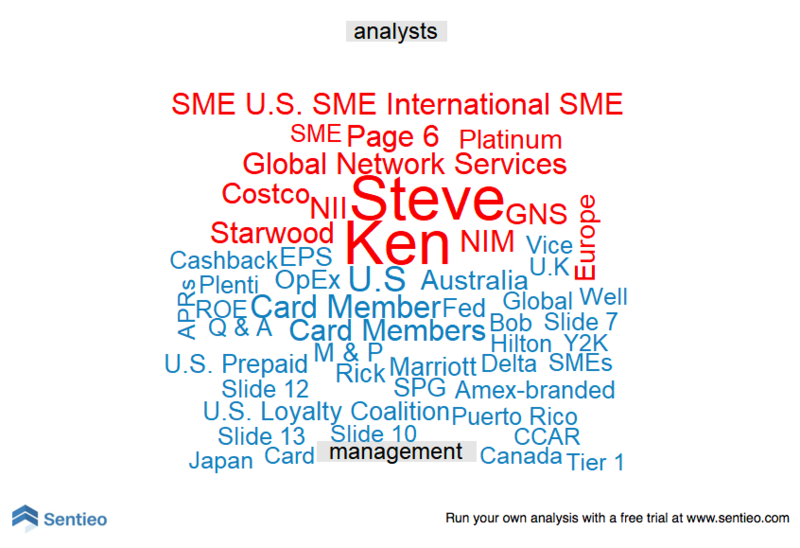 Comparing analyst and Management in a word cloud, analysts also expressed concerns about the Costco, Starwood, and Platinum programs which were not addressed by Management to a large degree. 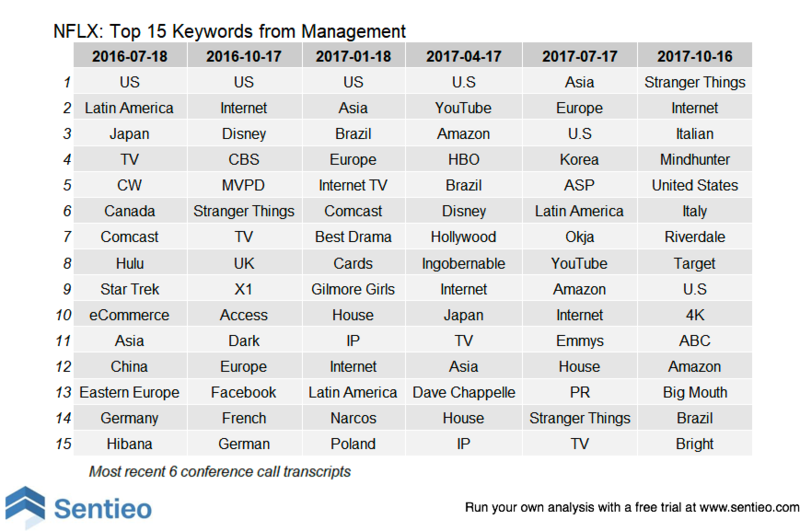 Author: SentieoAs former hedge fund analysts, we are very familiar with the challenge of digging through an inhuman amount of information to find that one key data point that makes or breaks your investment thesis. With new datasets appearing daily, your job as an investor continues to grow more challenging and complex. This is why we built Sentieo. Sentieo is a financial data platform underpinned by the latest search technology. We overlay search, collaboration and automation on key aspects of an analyst's workflow so that you can spend less time searching and more time analyzing. Don’t take our word for it. We would love nothing more than to show you what we have built.